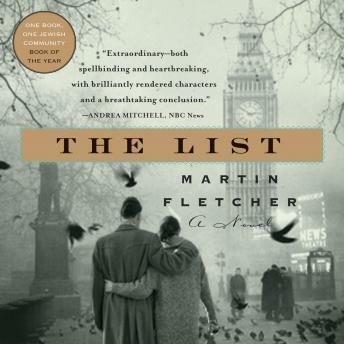 Winner of a Jewish National Book Award for his previous book, Walking Israel, NBC Special Correspondent Martin Fletcher uses meticulous research and his own family’s history in this stunning novel. Dramatizing explosive events in London and Palestine in the years directly following World War II, The List follows the lives of Edith and Georg, Austrian refugees who are expecting their first baby in a world unfriendly to Jews. Anti-Semitism sweeps across the streets of London even as the world learns of the atrocities of the Holocaust. As Edith and Georg desperately search for surviving family members, they struggle to stay afloat in a world riddled with terrorism, assassination attempts, and fear.